Intense crime drama tells the story of John (Josh Stewart) and Rosie (Alex Essoe from Starry Eyes and Tales Of Halloween) who live in the rural town of Cutter, Mississippi and work for drug runners. They plan to do one more job and when they collect their money, they plan to make a run for Mexico and an early retirement. When John returns after a job and finds Rosie missing, he suspects his odd neighbor Troy (comedian Bill Engvall) who seemed to be quite taken with his pretty girlfriend. When John sneaks into Troy’s house, he discovers his neighbor has been engaging in far worse activities than he could ever have imagined…and he may not get back out alive. Writer/director Marcus Dunstan (the Saw series, the Collector movies) crafts a lean and mean thriller about bad people going up against far worse people in a small backwoods town in rural Mississippi. 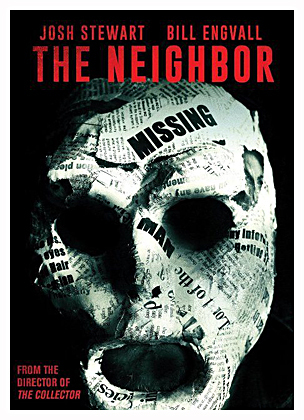 It does share some similarities with the recent Don’t Breathe, but is it’s own movie and aside from criminal types, who are looking to make a better life for themselves, being trapped in a house by psychotics, that’s where the similarities end. Dunstan gets his story started quite quickly, but not too quick that we don’t get to know John and Rosie a bit, and keeps the intensity cranked till the very last frames. We find ourselves rooting for John, even though he is not a good person, because Dunstan is able to make Troy and his boys a lot creepier. Add in a corrupt cop (Jaqueline Fleming) who already has it in for John and you have solid reasons to get behind our anti-hero couple. There is some graphic violence, but unlike his torture heavy Collector and Saw films, Dunstan uses it sparingly, so it is vicious and effective when it happens. The director does have a good visual eye and stages the action fast and furious with some nice suspense in-between the bullets and beatings. The tension is thick at times and while the climax may conveniently wrap things up, it is quite satisfying. There is some crisp cinematography from Eric Leach and a really cool score by Charlie Clouser. This little flick took me by surprise. I am not a big fan of the Collector films and never watched Dunstan’s Saw movies, as I was done with that series by then, but this high octane thriller took me a bit by surprise. Sure there are some familiar story elements, but Dunstan uses those elements well and really cranks up the suspense and tension in the last hour, peppering it with moments of brutal violence that don’t overstay their welcome and are very effective because of it. A good cast helps the filmmaker out and overall, cast and crew deliver a solid and engrossing thriller. MonsterZero NJ Double Feature Tip: Don’t Breathe, which would make a great co-feature, is down the road on home media, so I’d pair this up with Bound To Vengeance for a night of vicious and suspenseful crime thrillers.